The Additel Model 928 Hydraulic Pressure Test Pump is a hand operated pressure pump designed to generate pressure to 15,000 psi (1,000 bar). This pump incorporates a dual-piston system which is ideal for filling large volume workload with the hand pump and providing smooth increase and decrease of pressure with the fine adjustment. The 928 Test Pump incorporates an isolation valve which isolates the calibration volume from the check valve associated with the hand pump. Because the check valve can often be a source of leaks and maintenance, the isolation valve provides more stable measurements and reduces potential maintenance of the pump. 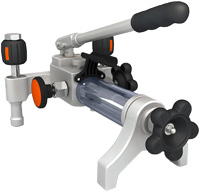 Two hand-tight quick connectors installed on the pump allow easy connecting and disconnecting to the test pump without the need for PTFE tape or wrenches. The Additel 928 is an ideal comparison test pump for calibrating pressure measuring instruments such as test gauges, indicators or transducers in the field or laboratory.